Did you know that a ladybug can devour up to 50 aphids or more in a day? They also attack scale, mealybugs and leaf hopper, but not on your precious garden plants or seedlings. 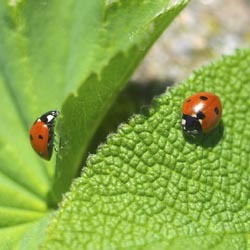 Invite ladybugs to your garden – they dine only on insects and won’t harm your plants in any way. The different names given to ladybugs are almost as numerous as the number of species. You may call them ladybugs (although they are not really bugs), lady beetles (they are technically beetles), lady birds or in Germany you would say “Marienkafer” (Mary’s beetles). In North America, there are more than 350 species of ladybugs, and more than 4,000 are found around the world. Most species can be identified by the pattern of spots on their elytra (flight wing covers). Lady beetles are members of the beetle family Coccinellidae, which means “little sphere.” In their life cycle, a lady beetle will go through egg, larval, pupal and adult stages. Lady beetles’ favorite food is the notorious aphid. 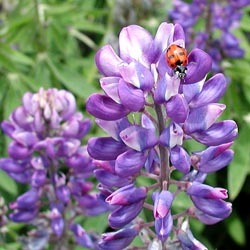 A female lady bug has huge appetite, eating from 75-100 aphids per day, while the male eats about 40 per day. Most lady beetles are predators, but a few are plant eaters, and can be crop pests. Lady beetles have some surprisingly innovative ways of protecting themselves. First is their coloring. Most predators know that bright colorings mean that their victim would likely taste bad and may even sting them. Lady beetles also produce a pungent odor when threatened, or may just play dead. Lady beetle larvae is kind of alligator-looking, so not many predators will not mess with it. Lady beetles may live in shrubs, fields, trees and logs. If you want ladybugs or lady beetles in your and – and what gardener wouldn’t? – you can buy them to release in the most needed spots. Ladybugs should always be released after sundown since they only fly in the daytime. During the night, they will search the area for food and stay as long as there is food for them to eat. The more they eat, the more eggs they lay and the more insect-eating larvae you will have. It is best if the area has been recently watered. Ladybugs tend to crawl up and toward light. Release them in small groups at the base of plants and shrubs or in the lower parts of trees that have aphids or other insects, and they will crawl up the entire plant as they feed, thoroughly eliminating unwanted pests. They may eventually move on and out of your garden or yard, but by the time they do their job is done and you have naturally eliminated many pests while helping ladybugs spread their beauty and helpfulness.